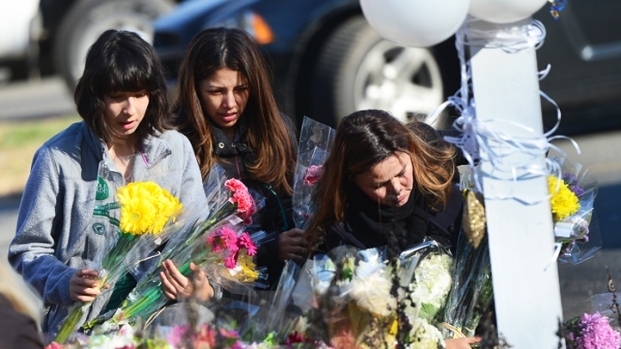 All of the victims of the Connecticut elementary school shooting were women and children, and each was shot by a rifle and hit multiple times, the state's chief medical examiner said Saturday as police released the names of those killed in the massacre. 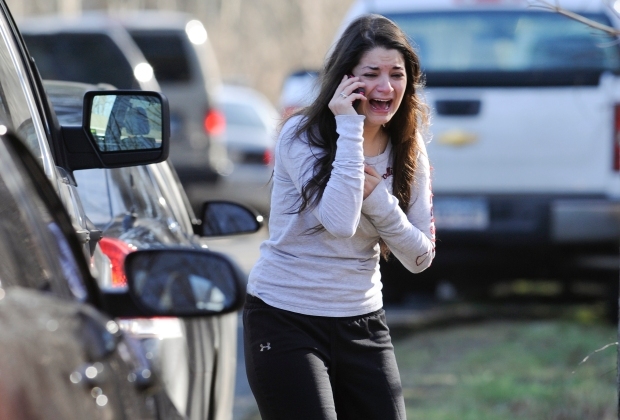 President Barack Obama planned to travel to the tragedy-hit suburb of Newtown on Sunday to meet with families of the victims and first responders as the country and the world mourn the lives lost in the rampage. The 20 children and six adult women killed at Sandy Hook Elementary School Friday died from gunshot wounds and had a "very devastating set of injuries," Dr. H. Wayne Carver said at a press briefing. All of the children -- eight boys and 12 girls -- were younger than age 10. Here is a full list of the victims who died at the school as provided by Connecticut State Police. The children were identified by photograph, Carver said, calling the mass shooting the worst thing he and his colleagues have seen. Carver said he personally conducted seven of the autopsies and that the number of gunshot wounds per victim ranged from three to 11. Asked whether the deceased had suffered, Carver said, “not for very long.” They were all shot with a .223-caliber Bushmaster rifle. Amid the sorrow, stories of heroism emerged, including an account of the Sandy Hook principal and the school psychologist who lost their lives rushing toward Lanza, in an attempt to stop him. Sandy Hook Elementary School will remained closed until further notice, while all other Newtown schools were expected to reopen Tuesday as detectives worked to piece together more of what happened. The mystery of 20-year-old Adam Lanza's motive for the massacre deepened as State Police Lt. J. Paul Vance told reporters that, contrary to earlier reports, the mother of the shooter, who was also found dead at her Newtown home, did not have a connection to the school. Investigators have been trying to learn more about the gunman and have questioned his older brother, who is not believed to have been involved in the shooting. Adam Lanza shot his mother, Nancy Lanza, to death at the home they shared, then drove to the school in her car with at least three of her guns, forced his way inside by shattering glass next to some doors and opened fire in two classrooms, authorities said. Within minutes, he killed the 26 victims and himself. Lisa Marlin, an educational assistant in the math lab, couldn't know about the horror unfolding nearby as she and co-workers dove for cover in a supply closet once they heard gunfire erupt in the building Friday. She had no students at the time of the shooting, and she and her colleagues prayed for their lives as they huddled in the tiny room while sounds of terror echoed on the school intercom. Now, she's left to pray for the lives that were lost -- lives of children she knew well. "For a half hour every day I work in the lunch room with those first graders and I know 15 of them very well. I tell them to sit on their bottoms, and I give them forks and I hear about their loose teeth and I hear about their play dates," a teary-eyed Marlin said. "I'm very, very sad for their parents. They were all wonderful kids. They didn't deserve this." Relatives of the shooter were at a loss for words. The tragedy plunged tight-knit Newtown into mourning and added the picturesque New England community of handsome colonial homes, red-brick sidewalks and 27,000 people to the grim map of towns where mass shootings in recent years have periodically reignited the national debate over gun control but led to little change.